Premature infants are born before the 37th week gestation. The earlier an infant is born, the greater the chance special care will be required before the infant is discharged from the hospital. Infants born premature will likely be cared for in the neonatal intensive care unit (NICU). NICU is designed for special cases when premature birth results in unique health problems and/or concerns. 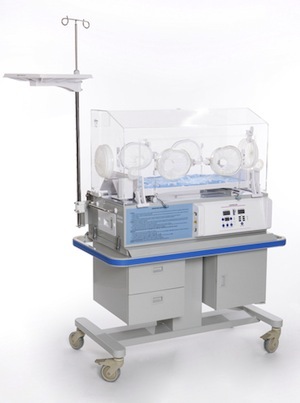 Special equipment and nurses trained in neonatal care are available in NICU. Why is special care needed for infants in NICU? During the 40 weeks of gestation, the female body holds on to the fetus long enough for full development. Full development means the lungs and other organs are mature enough to sustain life outside of the womb. When infants are born premature, lungs and other organs are not developed enough to sustain life, so life support machines or medications may be required. Round the clock monitoring and heated beds are just the start of care. Preemies may remain in NICU for several months before they are discharged to go home. Oxygen Delivery: Depending on the medical status of the preemie, there are several methods of oxygen delivery to choose from. The most basic is the oxygen hood. A plastic hood is placed over the head of the infant and oxygen is pumped into the hood. Other methods of oxygen delivery include a CPAP (face mask), ventilator (machine monitoring oxygen and other aspects of breathing) and the endotracheal tube. Feeding: Some NICU infants require a feeding tube inserted into the stomach through the mouth or nose. The feeding tube carries nutrients and nutrition to the stomach on a prescribed basis. IV nutrition can also be used in place of a feeding tube. If the preemie is well enough to bottle or breast feed, these feeding methods are often used in place of medical nutrition intervention. Other Care: The preemie may be placed in a special bed with heat lamps and a bili light. Heat lamps help regulate body temperature until the newborn is able to do so without help. The bili light is a bulb used to treat jaundice. Preemie care is something most hospital infant care units are prepared to undertake. In some cases, especially cases where infants are born very premature in small towns without well-equipped hospitals, premature infants may be air-lifted to the nearest large city for care. If you are considered about proper care for your infant in the case he is born premature, talk with your obstetrician and/or pediatrician about preemie care.